2017 was another successful year at our journal, with papers published covering a range of pregnancy topics from vaccines and weight management during pregnancy to choice of birth place and attendant, as well as important collections and supplements. Here is a selection of papers worth revisiting from BMC Pregnancy and Childbirth. Maternity care policy in England has opened the doors for women to choose their birth setting. With this change in policy, women now have the options to give birth in a hospital obstetrics unit, a freestanding midwifery unit, with a midwife affiliated with an obstetric unit, or plan a home birth. Despite the options provided, in recent years it has been observed that only 13% of women take advantage of non-obstetric unit settings. Previous studies have suggested that women chose one birth option over another due to the perceived level of safety in hospitals, a lack of information related to non-obstetric birth units, or sociodemographic factors. In this systematic review, 20 research articles were assessed using the best fit framework, delving into what influences women’s decisions based on their perspective. This study found women were influenced by the level of information they received regarding each birth setting, the opinions of healthcare providers, family and friends, the characteristics of the services provided, perceived level of associated risk, and experiences with previous births. This study found that each birth setting had its positive attributes and factors that concerned women. Women often relied on hospitals due to access to facilities in the event something went wrong as well as access to pain relief. Conversely, women often felt that hospitals were not as personal as other birthing options. Women who decided to deliver at home or use a midwifery affiliated unit felt that it was a more relaxed setting and that they had a greater sense of control and a relationship with the person caring for them. Alternatively, women in this setting felt they had to do extra research to gain the appropriate information outside of what was provided to them and worried about what would happen in the event they needed to transfer to a hospital. This study concluded that women with a low-risk pregnancy found giving birth in a hospital more straightforward than non-hospitals births. Overall, these opinions were shaped by each woman’s personal experience and pre-existing opinion, despite the access to multiple forms of care. Safe surgery and anesthesia are critical to comprehensive emergency obstetric care. International standards of safe practice have been formulated to address the needs of low- and middle-income countries to improve the quality and safety of surgical procedures using anesthesia. However, small studies across East Africa have shown that these standards are not being met by hospitals offering obstetric anesthesia. Epiu et al. conducted a large, cross-sectional survey of 64 hospitals in Uganda, both public and private, to assess adherence to guidelines for safe anesthesia. They found that only 5% met all the requirements set out by the international guidelines while 8% had no trained providers for anesthesia at all. Many hospitals lacked some of the equipment necessary for monitoring of anesthesia and the authors noted that much of the equipment present was obsolete. These results highlight the need to strengthen obstetric and general anesthesia services in Uganda by increasing training and access to equipment. These improvements would play an important role in meeting United Nations goals for reducing the maternal mortality ratio by providing safe cesarean section services when needed. Past research suggests that fear of childbirth is highest among first-time mothers. This fear not only predicts the use of pain medication, but it is linked to perinatal and postpartum depression, puts women at a higher risk for poor postpartum adjustment, and can act as a predictor of poor outcomes for labor and birth. In order to provide first time mothers with a resource to combat fear of childbirth, Duncan et al. conducted a randomized controlled trial implementing a mindfulness-based childbirth workshop. In the trial, the intervention group utilized the workshop while the control group underwent standard preparations for childbirth. The workshop, titled “Mind in Labor (MIL): Working with Pain in Childbirth,” was an 18-hour program, utilized in the 3rd trimester for both the mothers and their partners. The MIL workshop taught the participants yoga, walking meditation, partner touch, mindful breathing, and instruction grounded in mindfulness as strategies to cope with labor-related stress. 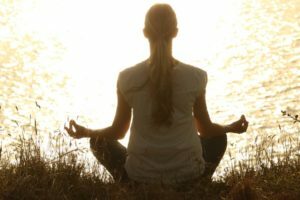 The mindfulness strategies used in the study are based on a nine-week Mindfulness-based Childbirth and Parenting program which in turn is based on Mindfulness-Based Stress Reduction. The overall goal of the workshop was to teach women the traditional topics needed for childbirth preparation, how to become more aware of their bodies, separate the cognitive and emotional aspects of pain and replace it with the goal to decrease fear, and show participants ways to cope and support each other throughout the process. The results of this trial found that there was a reduced rate of opioid analgesia in the MIL group as compared to controls, but no reduction in the overall rate of epidural or perceived pain retrospectively. The results also suggested that participants in the MIL group had marginally fewer perinatal and postpartum depression symptoms as compared to the controls. Most notably, participants in the MIL group were significantly more likely to feel confident in their behaviors throughout labor. In conclusion, a mindfulness based approach to childbirth preparation is promising avenue for continued research in reducing fear of childbirth. Birth trauma, an extreme negative experience during childbirth that can result from a number of factors, can lead to ongoing poor mental health, affecting the woman herself, her relationship to her family, and her ability to bond with her child. A number of studies have identified a perceived lack of control of decision-making as a major factor in the experience of birth trauma. Additionally, a lack of emotional support of women during birth has also been identified as a risk factor for birth trauma. In this qualitative study by Reed, Sharman, and Inglis, from our collection ‘The Role of Structural and Interpersonal Violence in the Lives of Women,’ nearly 750 women out of over 900 who completed an online survey answered an open-ended question about birth trauma. While one third of them described birth trauma related to medical concerns or adverse events, the other two thirds described trauma relating to care provider actions and how they were treated during labor and birth. Accounts of trauma included care providers disregarding or not seeking women’s preferences regarding interventions, women not being believed regarding onset of labor or timing of pushing, outright lies and threats to coerce women into consenting to interventions, and physical violations such as internal examinations on women who had explicitly not consented. These experiences were common across cultural contexts and birth settings. This highlights the global nature of the problem and the need for maternity services to comply with recommendations from the World Health Organization and others regarding women-centered maternity services and potentially unnecessary medical interventions. In addition, it contributes to ongoing debate about the accuracy and efficacy of standards and assessments used during labor and birth. The study “Factors Influencing Choice of Birth Place Setting from the Perspective of Healthy Women in the UK” – did it say anything about how women viewed the attractiveness of the different birth place depending on if they were first time mothers or second / third time mothers? Tovah has been an Editor for the BMC series since 2016. Before moving into publishing, Tovah received her Ph.D. from Johns Hopkins University, USA, where she studied calcium signaling in yeast, developing a novel microscopy probe for real-time measurement of calcineurin activity. An early fascination with Punnett squares lead to a focus on genetics, which then broadened into an interest in the communication and application of scientific research across disciplines. Janelle joined the BMC series as Assistant Editor in 2017. She earned a Bachelor’s in Psychology and a Master’s in Neuroscience from the University of Hartford.